These are all phrases that I’ve heard over the years from students, and these phrases are all now banned from my classroom. It is not because I’m not interested in hearing what my students have to say, nor is it because I think that everyone should love math as much as I do. It is because the whole idea of a self-fulfilling prophecy is a real issue in the math classroom. Some students are afraid of math, while others don’t see the need for it. Some students dislike the tedium of math practice, and some simply do not understand the concepts at all. No matter the thought process of the student, what the student perceives many times becomes his or her reality. So, how do we break the cycle? How do we inspire a love of math (or, at least, a “non-hate” of math) in our students? We first need to examine the relationship between math and Christianity. Some of you might be thinking right now, “What relationship between math and Christianity? Math has nothing to do with God.” Math has everything to do with God! Colossians 1:16-17 says “For by Him all things were created, both in the heavens and on the earth, visible and invisible…He is before all things, and in Him all things hold together.” God created math, and God is the reason that math works. The more we study math, the more beautiful it becomes. We see the relationship between the centroid, orthocenter, and circumcenter of a triangle, and we realize that it is not coincidence that those three points are always collinear, no matter what the triangle’s measures are. We learn that the relative maxima and minima of a function occur where the derivative of the function is zero, and we truly note the connection of the derivative and the slope of the tangent line. We derive the graphs of secant, cosecant, and cotangent from the unit circle and see the elegance of the correlation between those graphs and the graphs of their reciprocal functions. When a student realizes that math isn’t some man-made torture device but a work of art from our loving God, attitudes start to change. God created each of us perfectly, yet differently. He gave each of us varying gifts and abilities, likes and dislikes. Some of us understand the very technical definitions, words, and examples presented in a traditional math class, and others of us need the mathematical ideas and concepts explained in various (and sometimes very unconventional) ways. One of my jobs as a teacher is to try to explain a concept in as many ways as possible until every student understands. When a student feels comfortable asking questions and/or admitting that he or she does not understand the material being taught, we are able to see firsthand some of the differences in the way that we were created. We don’t all think the same way, nor do we all approach problems the same way. Does that mean that if a student doesn’t tackle a problem in the exact same way that I do that he or she is automatically wrong? Not at all! When a student realizes that he or she has some freedom in math to think for himself or herself, to try something new, to make mistakes without fear of the teacher’s judgement, then he or she starts to enjoy math more. In math, we have to practice new concepts, just like an athlete has to practice a new skill or a musician has to practice a new piece of music. In most traditional classrooms, practicing math problems means that students work by themselves on a worksheet or on problems out of the book. While solitary practice does have its merits and is sometimes necessary, it is not typically looked on as an enjoyable activity. How do we make math practice fun and make our time in class still productive? One thing that I’ve found is that students love to work on individual whiteboards. There’s something about writing with a dry erase marker that even high school students love. Sometimes we all work together on whiteboards, and sometimes students work problems at their own pace while still on the whiteboards. Regardless, they are working problems and learning. Students also love games (and the prizes that follow). We have played many games of mathketball, bingo, the post-it note game, and lame bag in my classroom, and I believe that most students were having fun while we were doing math. And, they received some pretty nifty stickers as prizes. Will putting all these learning options into practice guarantee that our students will automatically love math? Unfortunately, no. But, it will go a long way into repairing the relationship that many of our students have with mathematics. For some students, they may even end up realizing that for them, math actually does equal love. Mrs. Chrissie Ficken graduated from Auburn University with a B.S. in Secondary Mathematics Education. 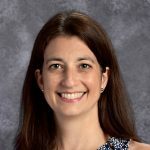 Mrs. Ficken began teaching in 1998 and has served since 2012 at CCS, where she currently teaches Geometry and Algebra 2. She holds ACCS Professional Certification. She and her husband, Wes, have two children, Holly and Matthew, who attend CCS.